For over two years now, I have been writing about unethical businesses using employee misclassification as a strategy to create an unfair competitive advantage over legitimate employers in the marketplace. According to an article this week on Construction Citizen, we may finally be moving in the right direction thanks to business leaders, the Texas Workforce Commission, and a bipartisan group of Texas legislators coming together to take action for the upcoming session of the Texas Legislature. 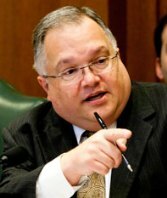 According to Texas State Senator John Carona (R-Dallas), "... the cheaters' day in Texas is over." Employee misclassification affects us all. Worker's wages are held down by companies who engage in this practice. Oftentimes they pay substandard wages and do not provide workman's compensation or health benefits. This drives more people to emergency rooms for routine health benefits increasing costs of health care for us all. Many deadbeat parents find this a way to hide from the collection of child support driving more single parents onto welfare and other subsidy roles. And the illegal workforce acts as a magnet attracting illegal aliens into a near slave-labor environment which holds down wages. Commissioner Tom Pauken who has long been a skeptic of addressing this problem through state regulation is now fully on board and is helping lead the charge for corrective action. Pauken stated during a hearing this week, "This is a problem that has to be corrected and we've come up with a workable solution." Pauken also this week, released a statement about the state of Texas' skilled workforce. According to Construction Citizen, Pauken told a group at the Texas State Technical College in Waco, “The time has come to return to an educational model which recognizes the value of career education and encourages the young people of Texas to have such learning opportunities at the high school and post-secondary school levels. It really is just a matter of common sense. We have accepted for too long this misguided notion that everyone should go to a four-year university. That flies in the face of reality and human nature. We have different talents and different abilities. Let’s design a school finance and accountability system which recognizes that and re-establishes the importance of skills training to provide young Texans with terrific career opportunities." It would not be possible to pass legislation addressing employee misclassification without support of businesses in Texas. Recognizing the impact of this problem on legitimate businesses, the Texas Construction Association (TCA) says that employers who misclassify workers are able to underbid legitimate employers by as much as 25%. A spokesman for the TCA, Mike White said, "The commission's action today clearly sends the message that this is a serious problem that requires a focused effort to find a solution that will be strong enough to curb improper classification of construction workers." This is a step in the right direction on many fronts. The commission is asking the legislature to impose penalties on companies that intentionally misclassify employees as independent contractors when they are working on government contracts. As we are in an era of massive school construction, highway modernization and other state and local government building projects, this legislation will have a major impact on weeding out unethical and illegal behavior by some companies. TexasGOPVote will continue to monitor this throughout the 2013 legislative session and will be looking for legislators and other senators to support this issue, and we will shine a very bright spotlight on any roadblocks that may present themselves. This is a good step, and Texas Republicans can lead the way.